Obviously others had bought some because there was no full fat milk left. I would have gone for the light one anyway so it didn’t bother me but I was relieved to see I wasn’t going through be the only customer! 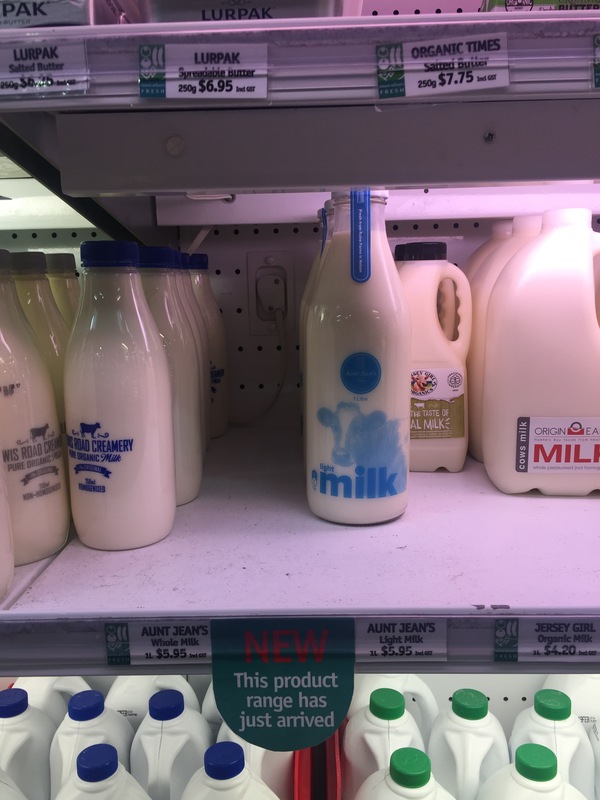 I was surprised at how big the bottles were but it took me a few days to realise my memory of glass milk bottles, albeit 30+ years ago, was pint bottles and this is, of course, a litre. I went home and had 2 glasses of milk. Nice! Creamier than the standard light milk from other dairies, maybe that’s because it’s not homogenised. 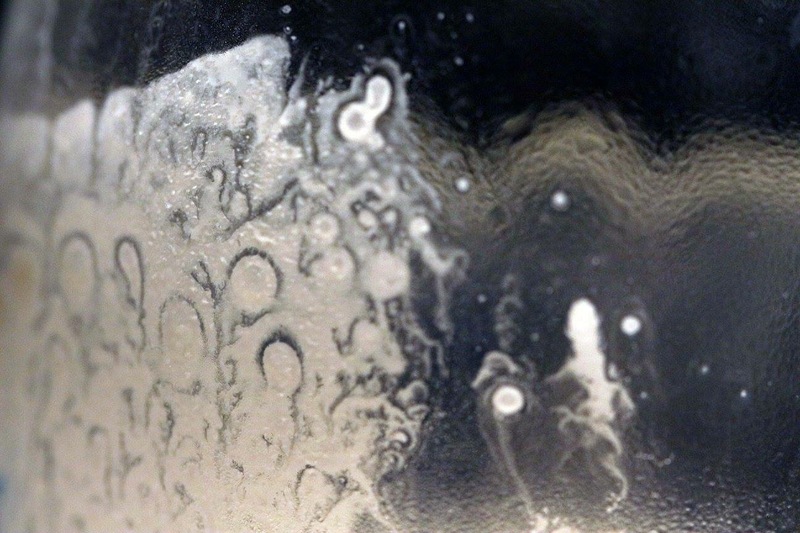 You can see that from the residue patterns in the glass. 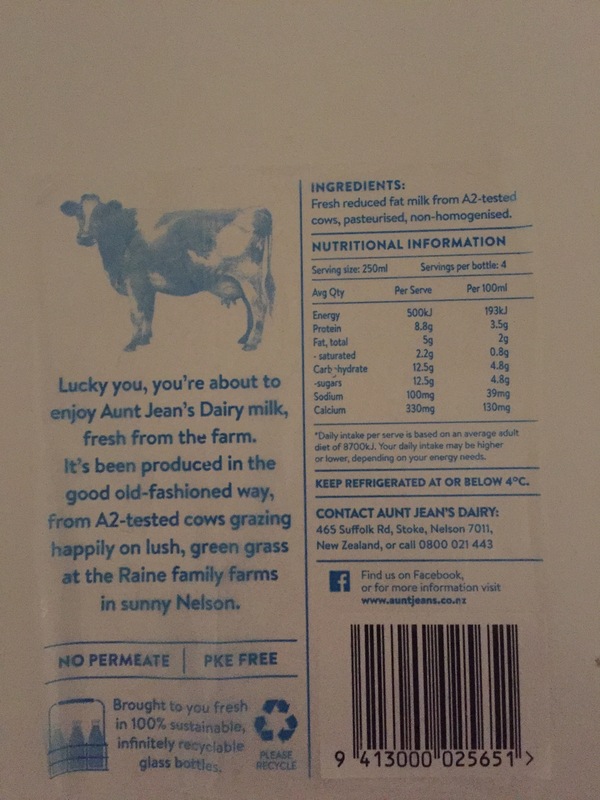 Then on Saturday I discovered that Aunt Jeans Dairy would be in store. And since I needed more milk anyway I got footed it down to meet them and say hello. 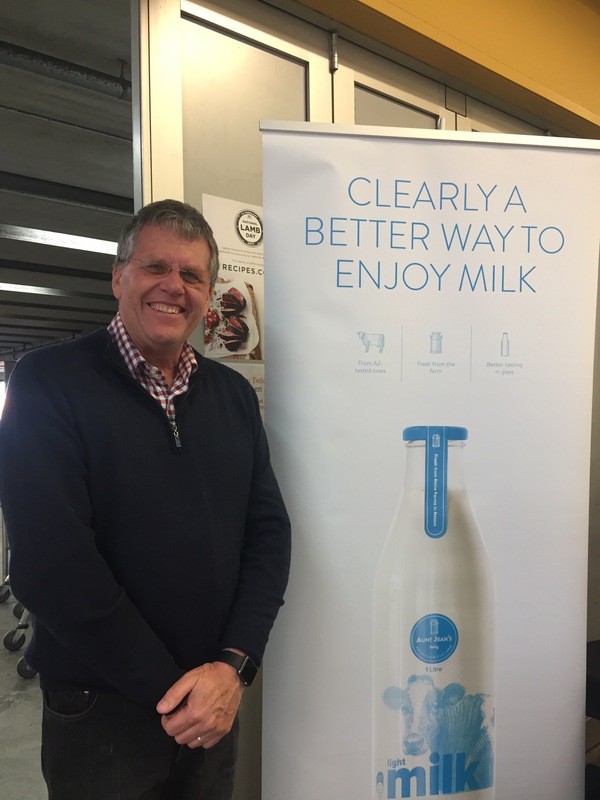 This is Julian Raine who owns the dairy. I did suggest that should be branch out into making cream for Christmas next year, I would be a ready customer. I also had a long chat with Sandrine who, I’m delighted to report, said the milk was flying off the shelves. She also told me that each bottle is labelled with the farm of origin and how surprised she was at the interest Wellingtonians were showing and how deep their questions were. No surprise to me, as the interest in food seems to just grow and grow here. A few people have asked if the bottles can be returned. Sadly not in Wellington because the infrastructure isn’t here but they do do it in Nelson, where they also supply lots of cafes and restaurants. Sadly, though they look great, the labels are plastic. 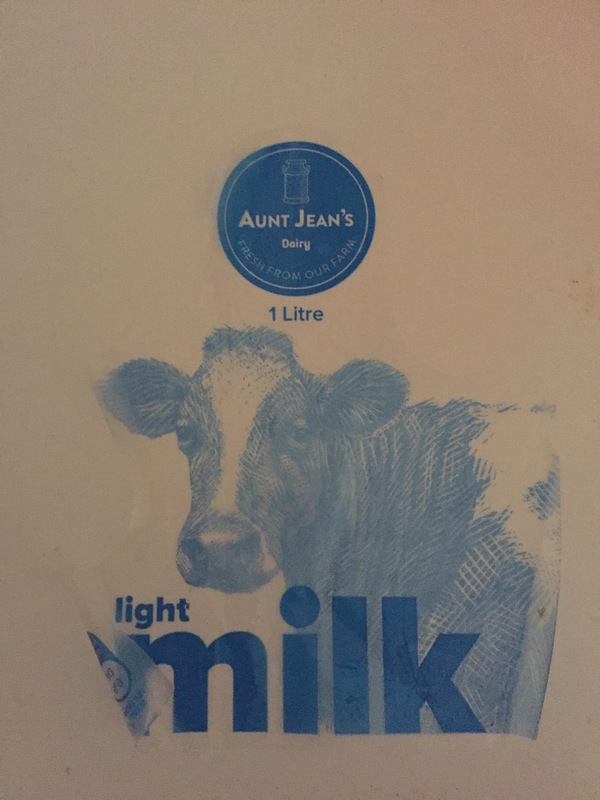 After much soul searching I’ve decided that I will continue to buy Aunt Jean’s milk for drinking but use powdered milk for baking or if I’m away and can’t get milk in glass bottles. I think it’s worthwhile supporting a small industry trying to do something that’s better for the environment. On some of the forums about waste free, people get attacked for drinking milk (and/or eating meat) because it’s bad for the environment. In some ways I applaud their dedication, but milk has always been a staple part of my diet and I really missed it. Growing up, we always had a choice of milk or water to drink at meals (sometimes supplemented by orange and pineapple Quosh ) and we got milk at school. 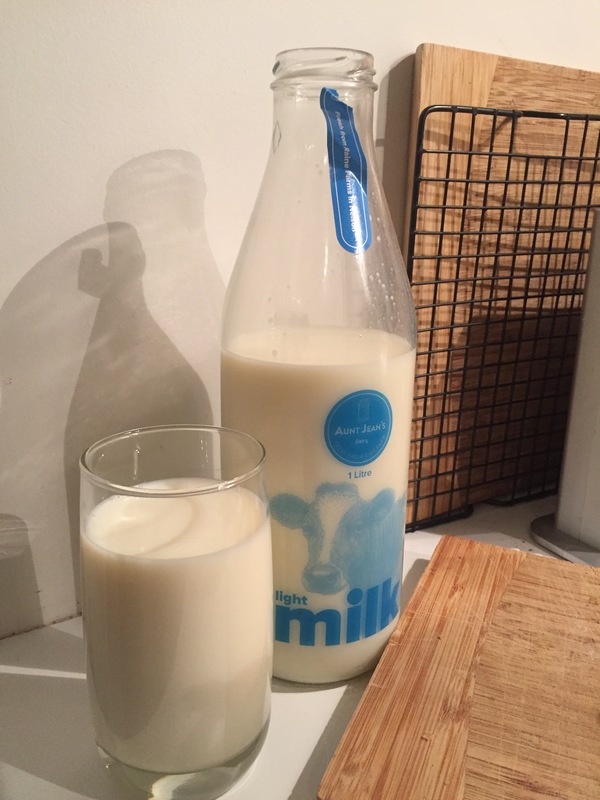 The milk used to be delivered every day to school by the milkman and, up until I was 7, it was in little glass bottles. When I was in 1st class (age 6-7), two of us used to bring the crates of milk into the 5 classrooms. One day I dropped a crate and all the bottles smashed. What a mess! I can’t remember if I was released from the duty after that or if they gave me s second chance but I’ll never forget the smash. Of course, maybe milk is in the blood in some ways. My grandfather came to NZ in 1928 and was a dairy farmer in Apiti. (A district just north of Fielding) He returned home to take over the farm in Northern Ireland in the early 1930s (after the Napier earthquake) but obviously genetic links are stronger than you expect. I could go meat free fairly easily but not dairy free! I don’t eat a lot of meat but when I do I enjoy it. I had wondered if the labels were plastic or printed on the bottles. They could use glued-on paper labels. (Pics peanut butter do great labels which are easily removed.) But glad to hear that (real) milk is back in your life. Interesting about your grandfather. There’s a book about Apiti called “Apiti! Where’s That?” by Ivan George. I searched for that book in the library but couldn’t find it. Must go have another look! Ask Beth to look out for the book for you. It used to come through the Palmy shop quite regularly.